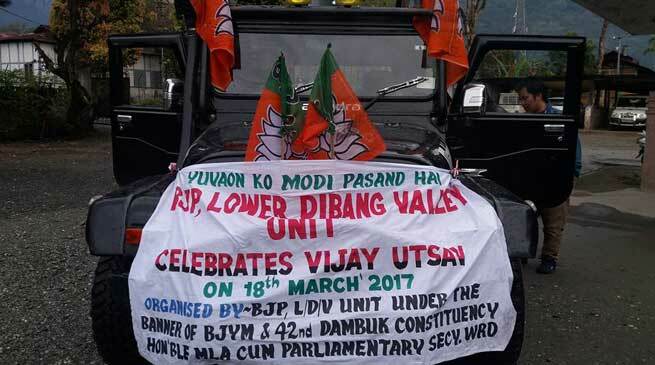 Arunachal Unit of Bharatiya Janata Party celebrated the “Vijay Utsav” today at all over the state. Rallies and Procession has organised in several places to mark the day as Vijay divas of the party. in Tawang Public School Ground that was attended by Local MLA Tsering Tashi, District President Sange Chhodup, District Executive Members, Senior party Leaders, Party worker amidst huge gathering. In Roing the party leaders and workers assembled at Mayudia filling station with their bikes and cars and took out a victory rally from Roing to Shantipur . This was to celebrate the huge mandate party got in the recently concluded Assembly Elections in Uttar Pradesh & Uttarakhand & formation of BJP Government in Manipur & Goa and to pay gratitude to the People for their love & support. Expressing happiness & solidarity over the leadership of Prime Minister Narendra Modi party leaders were full of praise for him. party leaders felicitated each other with the party scarf & distributed sweets.